Amid plains, lakes and marshes of vast country are scattered these old Russian towns. Known collectively as the Golden Ring of Russia, they actually form a circle which extends from Moscow towards the north-east. Each of these towns played an important part in the history of the Russian State, both in its early period, when the Russian lands and principalities were being united under the sway of Moscow, and later, when the independence of the country was at stake. While the architectural monuments of these towns are the stone chronicles of the country's history, it is also an area which has preserved many old artistic traditions particularly the painting of the beautiful lacquer boxes for which Russia is so famous. Life here is completely different from the big cities and for an opportunity to see true Russia, this is a tour worth taking. Moscow - Rostov - Yaroslavl - Kostroma - Suzdal - Vladimir - Moscow.  PM Kremlin tour (territory and cathedrals, Armoury Chamber. Transfer to the airport for international flight. Meeting with the guide at the airport upon arrival, transfer to the hotel. In the morning drive to Rostov Velikiy - distance is 200 km, drive will approximately take you 2 – 3 hours to reach this ancient town. 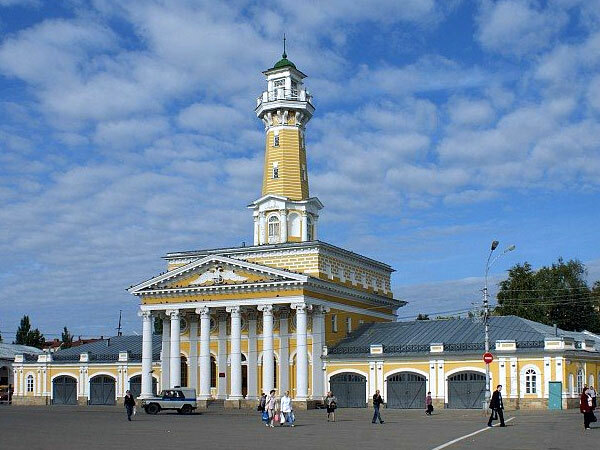 Rostov is one of the oldest towns in the country and a tourist center of the Golden Ring. It is located on the shores of Lake Nero.While the official name of the town is Rostov, it is also known to Russians as Rostov Veliky, i. e. Rostov the Great. This name is used to distinguish it from Rostov-on-Don, which is now a much larger city. Enjoy the tour of the city, visit to Finifti Museum – a unique museum, which houses a great collection of miniatures on enamel. Worth seeing and it will be hard to believe that everything presented was made by people, a kind of handcraft. 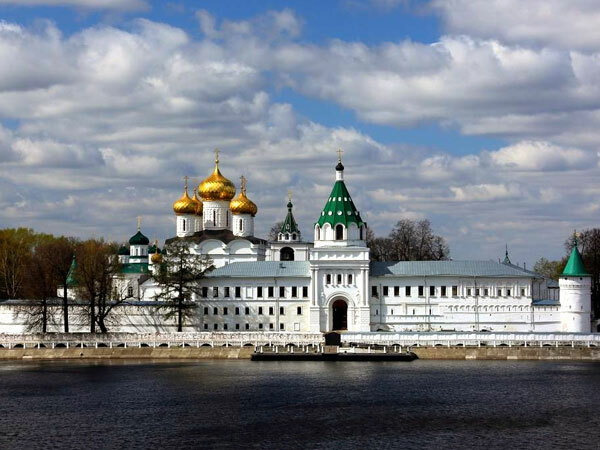 The Kremlin of Rostov Velikiy is a zest of this ancient town that is worth visiting and seeing. The cathedral and four tall Kremlin churches with their silver "blind" domes were imitated throughout the city. This is particularly evident in the Savior-on-the-Market church and the cathedral church of the Nativity convent, both dating from the 17th century and situated near the Kremlin walls. The oldest church within the town center was consecrated to St. Isidore the Blessed in 1565. They say that Ivan the Terrible had the architect executed, because his church was so much smaller than its predecessor. In the afternoon you are welcome to proceed the tour to Yaroslavl. 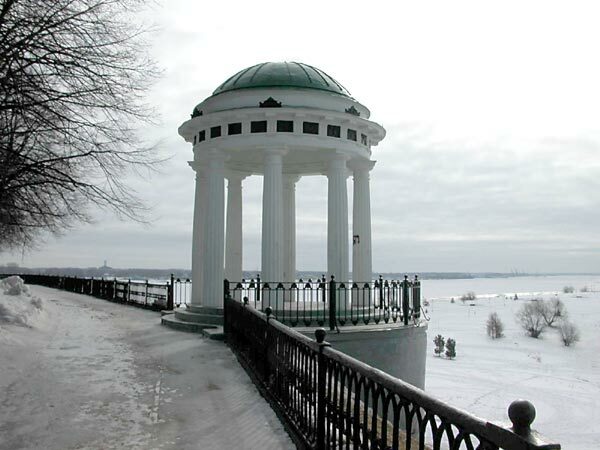 Yaroslavl is the oldest of all the currently existing towns on the Volga. 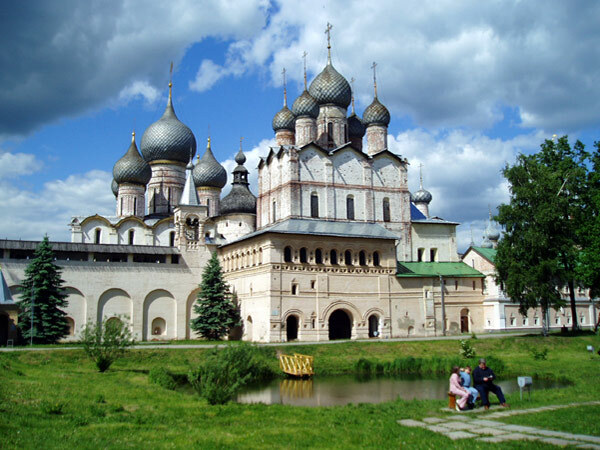 Yaroslavl was founded by a prince of Kievan Rus Yaroslav the Wise and during the period of his ruling the Principality of Rostov (988—1010) when he stepped ashore for the first time near the area now known as 'Strelka', a favourite contemporary park. 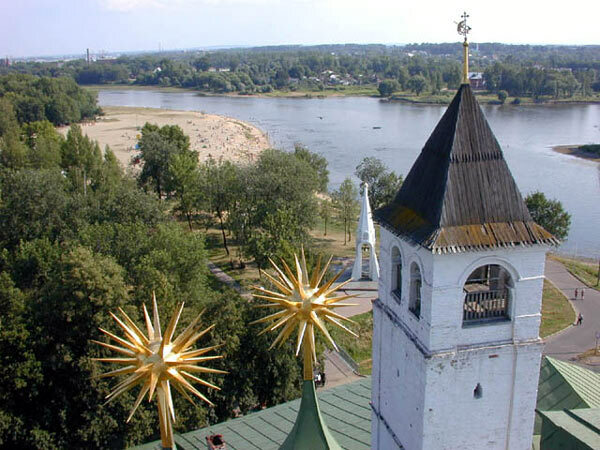 On this spot which was well protected from attack by the high, steep banks of the Volga, Kotorosl and Medveditsa Rivers, Yaroslav and his men began to set about building the first Yaroslavl Kremlin. 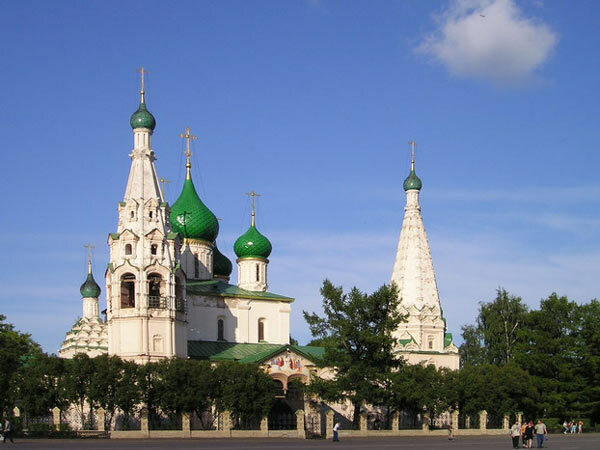 The first recorded event of Yaroslavl occurred as a result of famine, it was recorded as the Rostov Uprising of 1071. The name of the city is traditionally linked to that of its founder: Yaroslav. To the east of the boulevard, within the borders of the former defensive earthworks,the architecturally-rich 'nucleus' of the old city is to be found; an area criss-crossed by many narrow, small streets, in the middle of which one of Yaroslavl's most well-recognized architectural monuments is to be found. This is the Church of Elijah the Prophet which, in the same way as the Epiphany Church, is a very prominent example of the way in which the city developed in the 17th century. The most well-known building in the city is the 'Spaso-Preobrazhensky' ('Transfiguration of the Savior') Cathedral of the Spassky (St Savior) Monastery. This monastery was originally founded in the 12th century and thus it, and its cathedral, are the oldest buildings in the city. 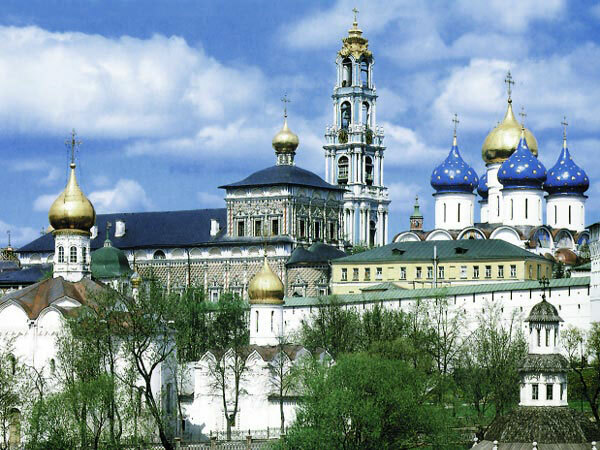 The Transfiguration Cathedral itself, built in 1516, is the oldest detached building standing in the city. 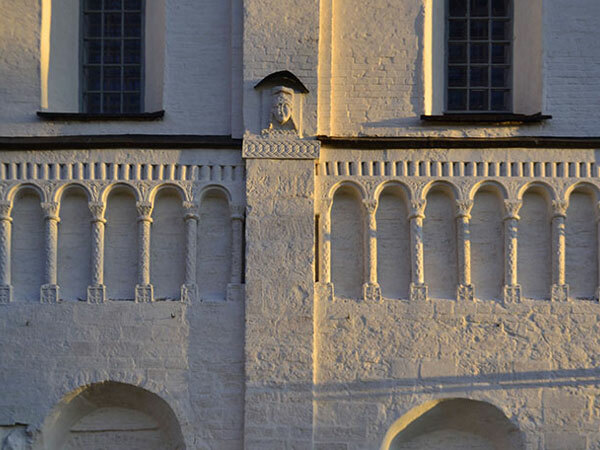 Typical for a Russian monastery of the Middle Ages, the Spaso-Preobrazhensky Monastery in Yaroslavl was not built to be no more than a place of worship, but also to be a citadel and Kremlin in case, in times of war, there was a need for such a facility. This is still visible today as the monastery is surrounded by a thick 16th century, white-painted wall, complete with watchtowers and embattlements. You will have eve at leisure to relax at hotel or you may take some time for self-exploration the town. In the morning you are welcome for breakfast at the hotel restaurant. Then please be ready to be transferred to Kostroma town – distance is approximately 85 km, may take up to 1-1,5 hour by bus to reach the next destination point of the program. The city was first recorded in the chronicles for the year 1213, but historians believe it could have been founded by Yuriy Dolgorukiy more than half a century earlier. Like other towns of the Eastern Rus, Kostroma was sacked by the Mongols in 1238. It then constituted a small principality, under leadership of Prince Vasily the Drunkard, a younger brother of the famous Alexander Nevsky. Upon inheriting the grand ducal title in 1271, Vasily didn't leave the town for Vladimir, and his descendants ruled Kostroma for another half a century, until the town was bought by Ivan I of Moscow. Built in 1559-1565, the five-domed Epiphany Catheral was the first stone edifice in the city; its medieval frescoes perished during a fire several years ago. The Ipatyevsky monastery survives mostly intact, with its 16th-century walls, towers, belfry, and the 17th-century cathedral. In the afternoon you will have a drive to Suzdal. Fabulously ancient and wonderfully adorned, Suzdal occupies a special place among the other Russian towns. The entire town is a museum which has hardly changed for the past two and a half centuries. Over one hundred monuments, dating from different periods of the past millennium are concentrated here. You will visit the Kremlin, the ancient trading rows and Krestovaya Palata, visit the unique museum of wooden architecture, see lots of big and small churches and listen to the bells' concert in Spaso-Efimievsky monastery. Since morning you will have a chance to admire the sights of ancient Suzdal. 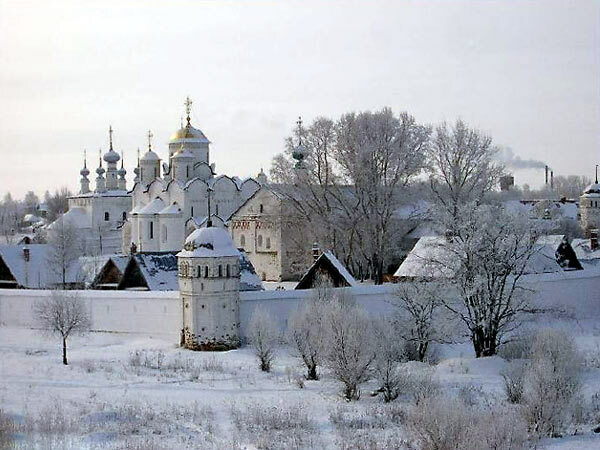 The Suzdal Kremlin is the oldest part of the Russian city of Suzdal dating from the 10th century. Like other Russian kremlins, it was originally a fortress or citadel and was the religious and administrative center of the city. It is most notably the site of the Cathedral of the Nativity. Together with several structures in the neighboring city of Vladimir, it was named a UNESCO World Heritage Site in 1992. The Saviour Monastery of St. Euthymius was founded in the 14th century, and grew in importance in the 16th and 17th centuries after donations by Vasili III , Ivan V and the Pozharsky family, a noble dynasty of the region. Among the buildings erected during this period were the Assumption Church, the bell tower , the surrounding walls and towers, and the seven-domed Cathedral of the Transfiguration of the Saviour. 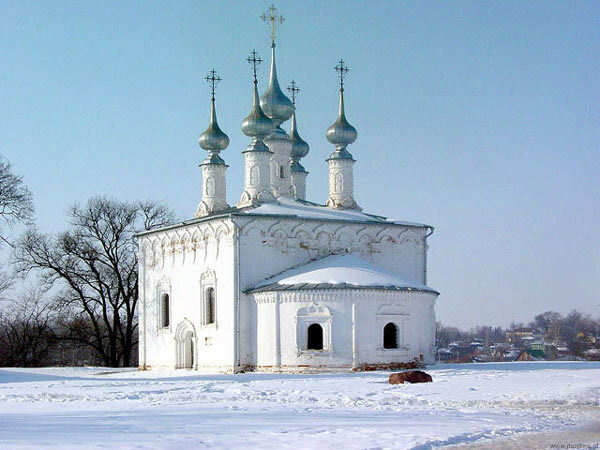 The cathedral was built in the style of the Grand Duchy of Vladimir-Suzdal. Its interior contains restored frescoes by the school of Gury Nikitin of Kostroma, dating from 1689. The tomb of Dmitry Pozharsky lies by the cathedral wall. In the afternoon you will visit Vladimir town. The history of this town goes back over one thousand years. It was founded in the 990’s on the banks of the river Klyazma by Prince Vladimir. The rise of Vladimir began under Andrey Bogolubsky, the son of Yuri Dolgoruki who founded Moscow. 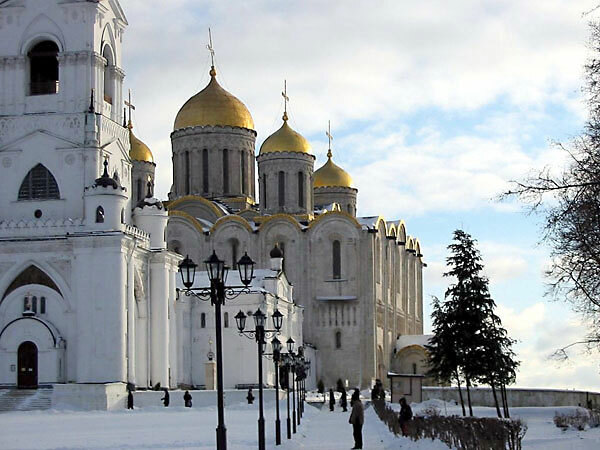 The magnificent five-domed Assumption Cathedral was designed as a sepulcher of grand princes and dedicated to the holy icon Theotokos of Vladimir, which had been brought to the city by Andrew the Pious. 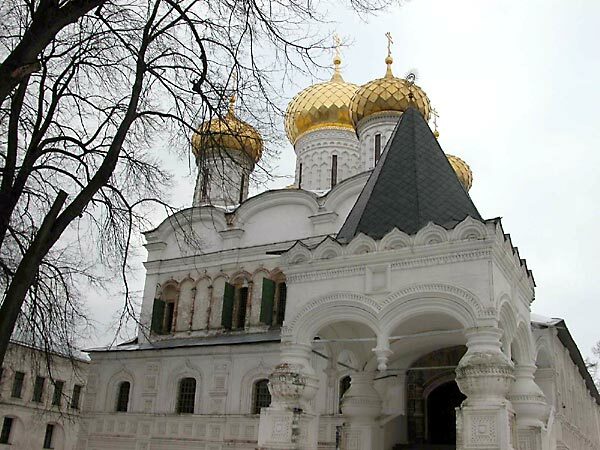 The cathedral was constructed in 1158–1160, expanded in 1185–1189, and painted by the great Andrei Rublev1408. In 1810, a lofty bell-tower was added in Neoclassical style. The warrior-like cathedral of St. Demetrius was built in 1194–1197 as a private chapel of Vsevolod the Big Nest in the courtyard of his palace and was consecrated to his holy patron, St. Demetrius. For all its formal unity, the cathedral represents an international project of Russian and Byzantine masters, Friedrich Barbarossa's masons, and carvers sent by Queen Tamar of Georgia. You will be transferred back to Moscow in the late afternoon – either to the airport or to the train-station. Today you start your tour from Red Square-the heart of Moscow Red Square. Originally a commercial centre, Red Square has been at the very centre of Russian history since the 15th century, from Ivan the Terrible’s confession of his misdeeds to the people in 1550, to great demonstrations, executions and the great parades of the Soviet union’s military might. Ironically, “krasny” originally meant beautiful; it came to mean “red” only in the last century! From the time of Ivan the Great the square was used as a huge gathering place for public events, markets, fairs and festivals. The magnificent square encompasses an area of over $ 70,000 square metres and is bounded by the Kremlin walls, St.Bazil’s cathedral, the Historical museum and GUM departments store, the shopping arcade, that was completed in 1893. At the southern end of Red Square is the almost fairy-tale like building of St Basil’s cathedral, commissioned in 1552 by Ivan the Terrible to celebrate his conquering of Kazan; legend has it that the architect was later blinded so that he could never repeat such a building that is so traditionally Russian. It is built of brick and comprises many colourful asymmetrical helmet & onion domes situated over nine chapels; the interior is full of 16th and 17th century icons, frescoes and ceiling paintings of subtle blues and pinks. The Christ the Saviour Cathedral was designed by the great architect Konstantin Ton, who was also responsible for the Grand Kremlin Palace and the Kremlin Armoury and whose church designs pioneered the Byzantine-revival style, the cathedral was erected, for maximum effect, on the embankment only a few minutes' walk from the Kremlin. The cathedral was consecrated on the day Alexander III was crowned, May 26, 1883. In 48 years after its opening, in 1931 according to the personal order of V.Stalin St. Savior Cathedral was fully destroyed. Later a big open-air swimming pool was built on its place. In 1994 according to the initiative of the Moscow Mayor Yury Luzhkov, the new construction of the St. Savior cathedral started and it was finished in 1997, by the 850th anniversary of Moscow. It was fully rebuilt according to the old drawings of the destroyed cathedral. Nowadays the visitors can fully enjoy not only the breathtaking view of the of the Cathedral but as well the marvelous view of Moscow from the 40 meter high observation platform. You might be surprised how many ancient and magnificent structures one can see within its walls: 15th century cathedrals (the coronation, wedding and bury place of Russian rulers), bell-tower, Patriach’s Palace, Grand Kremlin Palace and of course the richest museum - Armoury. The Armoury has a fantastic collection of insignia of Imperial power, precious clothes, ceremonial harness and unique collection of imperial carriages. The 17th century throne of Alexey Romanov covered with a mosaic of turquoises and 900 diamonds, a pheloneon of Metropolitan Platon decorated with 150,000 pearls (it took the embroiderer 2 years to work on the pattern! ), the famous Faberge eggs – one help admiring the priceless and luxurious items.. Visit the 15th century cathedrals with fantastic interiors afterwards.